Here's how Windows 10 feels on very old hardware. For a modern operating system with an vast range of capabilities, Windows 10 is an incredibly lean and mean operating system. To find out just how lean though, I decided to install Windows 10 on a few ancient PCs to see how well it runs. The actual experience might surprise you. My first testbed would be a Dell Dimension E510. Carbon-dating of the chassis tells me it’s from the year 2006 A.D. The machine had been moldering away in a pile of old rigs at PCWorld and obviously wasn’t in its original state. 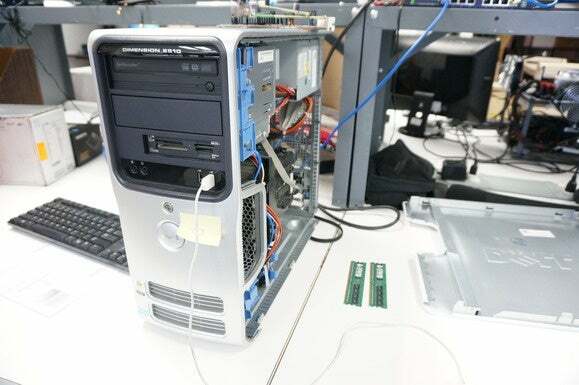 Inside it has perhaps one of Intel’s worst-respected CPUs, a 3.2GHz Pentium D, as well as 2GB of DDR2 RAM and a dead video card. I removed the machine’s fax modem. I dropped in a Radeon HD 6570 and a 320GB, 7,200rpm hard drive. I installed the only version of Windows 10 I had in ISO form at the time: Build 10162. It’s a few weeks old and the last technical preview ISO released by Microsoft before pausing the entire program. Note: The final build is supposed to offer some performance enhancements, but I honestly don’t expect a fundamental shift from a two-week-old build of the OS. My experience with this 9-year-old box shocked me: It ran super-smooth and was surprisingly responsive just navigating Windows 10’s menu system. Reality hit me in the face, though, when I decided to actually do something—like task the Edge Browser with opening five media-heavy pages, including PCWorld.com. That’s when it all ground to a halt. Some of that comes from the albatross of the truly atrocious Pentium D CPU, and some of that comes from the mere 2GB of memory in the system. 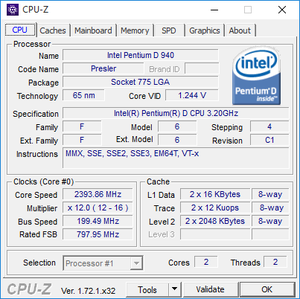 A dual-core Pentium D works with Windows 10 but it’s just not pleasant. In fact, just leaving the Edge browser open and letting it sit for a few minutes caused the Dell’s CPU to run at 100-percent load. Doing nothing. Moving to Google’s Chrome, which has a reputation for being a memory hog, it was just as bad—I waited 10 seconds for the Start Menu to pop up. My verdict: I’m amazed it works at all. Be prepared for constant thumb-twiddling, however, as the CPU ramps up to 100 percent for long periods of time and the hard drive gets thrashed. Maybe, just maybe, it’s time to take this as a gentle nudge to upgrade your 2006-era or older machine. My second experiment in underpowered hardware was a 2009-vintage Lenovo IdeaPad S12 netbook. My specimen had a Intel 1.6GHz Atom N270 in it, 2GB of DDR2, and a 5,400rpm, 160GB hard drive in it. Netbooks barely had the power to run Windows XP. If there’s one CPU that disappointed people more than the Pentium 4, it was the early Atom CPUs, which were universally excoriated for their performance. Windows 10, amazingly, installed just fine on the S12. Like the Pentium D box, however, the processor almost continually runs at full load doing the most basic tasks. Opening five-media heavy websites meant waiting an inexorablly long time for the computer to respond to other instructions. Just running a single instance of Youtube on a Netbook will eat most of the CPU cycles. 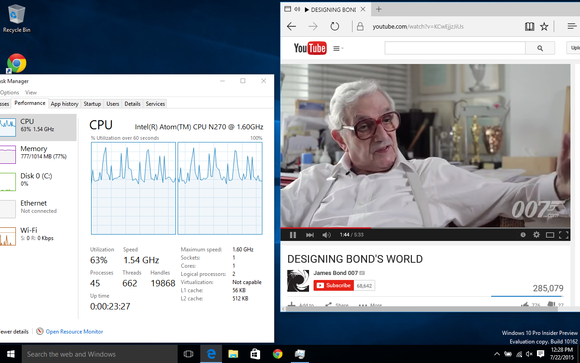 Windows 10 Edge though, will at least work in Youtube while Chrome chokes. I’ll give the S12 and Windows 10 this, though: The new Edge browser was capable of playing Youtube videos with far fewer hitches than Chrome.The last Netbook I played with years ago would not play Youtube videos in the Chrome browser without major hitches. The S12 with the Chrome browser and Windows 10 was no different, as it would continually drop frames and pause playing a 720p movie trailer. My Verdict: It works and installs just fine. It doesn’t make the Netbook experience any better. Let’s be frank, Netbooks were poor performers when they came out with Windows XP, so Windows 10 won’t magically make them better. If you’re running Windows XP and must have Windows 10, it’s a better choice because at least it’s a supported OS. If you’re on Windows 7 or Windows 8, the move isn’t a bad idea, either, as you get access to a more modern OS. The last machine I tried was a 2008-vintage Lenovo X61 that originally came with Windows Vista. Equipped with a 2.4GHz Core 2 Duo T8200 and 3GB of DDR2 RAM, I literally rescued this laptop from an e-waste bin, where it may have been sent because of problems with its Wi-Fi card. All I know is the X61 worked fine except for the Wi-Fi, so my browsing was done over the LAN port. Of the three here, it felt the fastest and snappiest. That’s no surprise: The dual-core T8200 is a good little CPU, and for general computing tasks is very usable. Drop an SSD in there and for most people, they’d never know the difference between this seven-year-old PC and a modern laptop. It’s far from it, though. Opening the five media-heavy sites in the Edge browser put a hefty load on the CPU, while a 2015 laptop would almost idle. My verdict: This is a very usable experience. If I ran on a tight budget, a Windows 10 upgrade over, say the original Vista, along with cheap SSD, would give me another couple of years’ service for general computing. 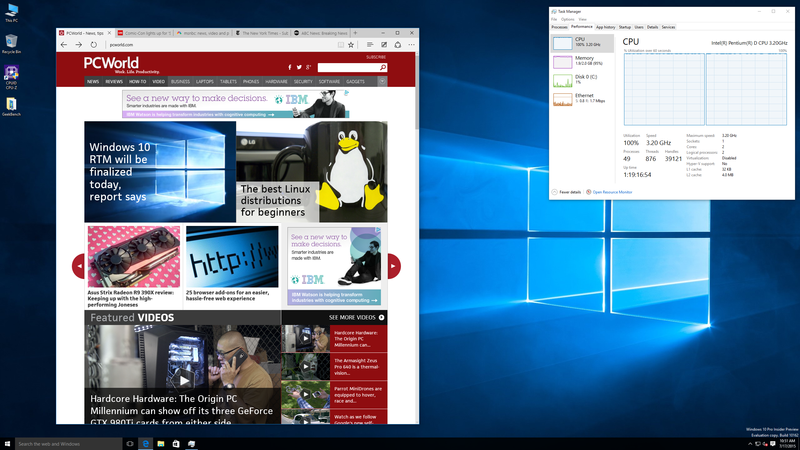 Windows 10 on an older PC is a compromise, at best. The 2006-era Pentium D is a borderline lost cause for all but the most basic computing tasks. Even there, it’s almost useless, as the CPU seems to be under heavy loads constantly. The same goes with 2009-era Netbook: Underpowered even when they first came out, you’d better take meditation lessons or you'll find yourself smashing it into the ground in frustration. Windows 10 loads and runs, but it’s pretty painful once you start actually doing anything. However, my perspective comes from someone who drives SSD-equipped, multi-core, tier-1 GPU-equipped computers all day. If it doesn’t snap to in a second, I’m upset. For someone who’s actually used to waiting, and waiting, and waiting for the machine to respond to a command on these two old dogs, a Windows 10 upgrade would feel the same—and also give you a new, more secure OS. The 2008-era X61, though, is another story: It’s actually very usable. For someone on a budget, Windows 10 on this laptop would be tolerable. This may be why analysts are predicting that Windows 10 won’t goose PC sales: You can get by with a seven-year-old laptop and the new OS if you really have to. You give up a lot, though, from battery life to performance and overall weight. Would you run Windows 10 on your old beater PC? Let us know in the comments.